Well here we are again a month later with no let up in the summer heat or the number of residential home air conditioning repairs in Oklahoma. We don’t think that we have ever seen more residential air conditioning repairs going on at the same time than we have this summer. Circle B Mechanical technicians have been working hard performing every type of repair there could possibly be on just about every type of air conditioning system. There is no need to convince you that it is really hot in Tulsa, Bristow, Stroud, Jenks and the rest of Oklahoma. When this type of heat and humidity goes on for this length of time, there really isn’t any other way to stay cool without an air conditioner that is in good working condition. If you are in a situation where you do not have an air conditioner, be sure to find a place that does! For the past month, our home air conditioning repair technicians have been working non-stop in all of the Tulsa, Bristow, Sapulpa, Jenks and Bixby areas. Our home air conditioning repair crews have been reporting that most of the problems are being caused by worn out parts and motor failures due to heat-related stress. When it is 105 degrees outside, your air conditioning unit can get as hot as 200+ degrees on the inside, which makes it very important to make sure that your system has clean filters and that nothing is blocking or preventing the air flow through and around the outside unit itself. An air conditioning unit must have good airflow through the outside unit in order to air-cool the motor and condenser coils. Air conditioning units also need to be able to circulate the cool air in the residence without restriction. When an air conditioner loses it’s efficiency, the air conditioner will overheat. This causes the bearings, electronics and other mechanical parts inside the unit to fail. If the air conditioner overheats too many times and you will have a heat related stress failure and most likely on a very hot day. Many of the heat related failures of air conditioning systems in Oklahoma can be avoided by yearly and seasonal preventive maintenance. There are a couple of things homeowners can do to help prevent home air conditioning repairs. First, always check your air conditioner filters and keep them clean. This lets the air circulate in the home easily and causes the air conditioner to work less. Second, make sure that the area around your outside air conditioning unit is free of debris, brush, and leaves. If your shrubbery is too close to the unit, trim it back so that the air can circulate through the condenser coil and the unit itself. This will reduce the heat within the outside unit and help to prevent a heat related failure. Sometimes only a repair or part replacement will cure your home air conditioning unit. Circle B Mechanical provides home air conditioning repair services in Tulsa, Bristow, Sapalupa, Bixby, Jenks and the surrounding communities. 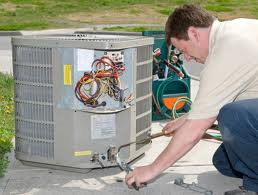 We also handle emergency air conditioning repairs and provide service maintenance agreements. A service maintenance agreement with Circle B Mechanical can help prevent Tulsa’s home air conditioning repairs. Call Circle B Mechanical at 918-367-6298, and we’ll take care of you and your residential air conditioning repairs. This entry was posted in Air Conditioning and tagged Air conditioning, air conditioning repair, Air conditioning service, Bixby, Bristow, filter changes, Jenks, Oklahoma, preventative maintenance agreements, residential air conditining repair, Sapulpa, Tulsa. Bookmark the permalink.